United Launch Alliance and NASA will share technical data to help ready the company's Atlas 5 rocket for astronaut passengers, officials announced Monday. The agreement places the Atlas 5 rocket among the top competitors to launch the next piloted spacecraft from U.S. soil after the retirement of the space shuttle. "I am truly excited about the addition of ULA to NASA's Commercial Crew Development program team," said NASA Administrator Charlie Bolden. "Having ULA on board may speed the development of a commercial crew transportation system for the International Space Station, allowing NASA to concentrate its resources on exploring beyond low Earth orbit." Colorado-based United Launch Alliance was passed over in NASA's last Commercial Crew Development, or CCDev, competition. When the agency announced the winners in April, officials said they gave priority to spacecraft developers because rockets would take less time to modify for manned flights. NASA divided $270 million among four companies in the April announcement, giving $92.3 million to Boeing, $80 million to Sierra Nevada Corp., $75 million to SpaceX and $22 million to Blue Origin. The competition was the second round of NASA's CCDev program, which provides federal funding to U.S. space companies building commercial human-rated spacecraft. All of the winners are designing spacecraft to carry astronauts to and from low Earth orbit destinations such as the International Space Station. But the space vehicles will need rockets to send them into orbit. Boeing, Sierra Nevada and Blue Origin could launch their spacecraft on ULA rockets. 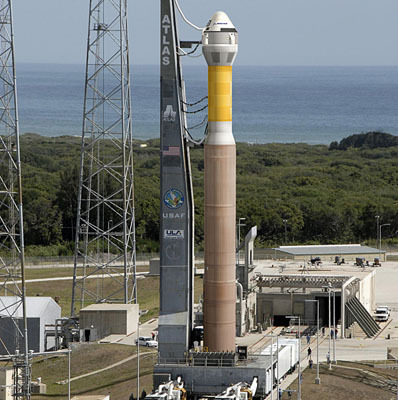 Sierra Nevada and Blue Origin have selected the Atlas 5 rocket to launch their spaceships. 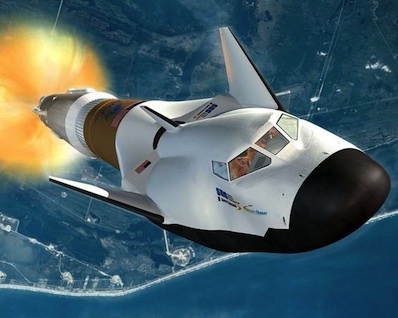 Sierra Nevada is working on a lifting body space plane named the Dream Chaser and Blue Origin, headed by Amazon.com founder Jeff Bezos, is developing a biconic capsule called the New Shepard. Boeing's CST-100 spaceship is designed to ferry up to seven astronauts to and from orbit. The company says the craft is compatible to launch on several rockets, including the Atlas 5, but managers plan to select a primary launch vehicle in the coming weeks, according to a Boeing spokesperson. Boasting a stellar success record, the Atlas 5 rocket has launched 26 times with U.S. military payloads, NASA science probes and commercial communications satellites. The Atlas 5's first stage is powered by a kerosene-fueled Russian RD-180 main engine, and its Centaur second stage features one or two RL10 engines burning cryogenic propellant. SpaceX will launch its Dragon capsule on the company's own Falcon 9 rocket. NASA's agreement with ULA doesn't provide any funding, but it facilitates data sharing among the two entities. Under the agreement, ULA will provide technical data on the Atlas 5 rocket to NASA, which will give input based on the agency's extensive human spaceflight experience. The space agency will also share draft human-rating certification requirements for ULA to review and provide feedback. ULA says it will continue design and analysis of its plans to outfit the Atlas 5 for human crews, conduct program reviews, develop a hazard analysis, complete a probabilistic risk assessment, conduct a systems requirements review, and accomplish several other milestones. The company will pay for the continued design work without any NASA money. NASA awarded ULA $6.7 million in the first CCDev competition in 2010 to advance the development of an Emergency Detection System, a computer that would monitor the health of rocket and spacecraft systems during launch. The system would issue commands for an abort to send astronauts away from a failing rocket. The $6.7 million agreement expired at the end of 2010. 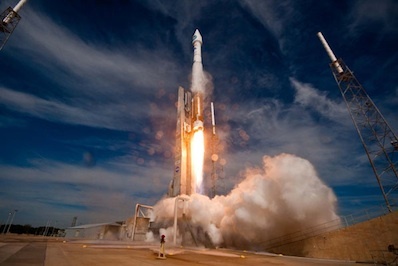 "This unfunded [Space Act Agreement] will look at the Atlas 5 to understand its design risks, its capabilities, how it can be used within the context of flying our NASA crew and maturing ULA's designs for the Emergency Detection System and launch vehicle processing and launch architectures under a crewed configuration," said Ed Mango, NASA's commercial crew program manager. ULA says the EDS computer is the only significant modification necessary for the Atlas 5 rocket to meet human-rating requirements. Other launch pad construction would be necessary to support crew launches, according to George Sowers, ULA's vice president of business development. "We believe this effort will demonstrate to NASA that our systems are fully compliant with NASA requirements for human spaceflight," Sowers said. "ULA looks forward to continued work with NASA to develop a U.S. commercial crew space transportation capability providing safe, reliable, and cost effective access to and return from low Earth orbit and the International Space Station."